FastDomain Review 2019: Is FastDomain a Good Hosting? Fasthosts is a popular U.K. hosting service that levels the playing field for sites of all sizes. With impressive standard features such as unlimited subdomains, unlimited 100MB mailboxes, and £130 in ad vouchers, small websites have the same tools to achieve success as larger sites on more expensive web hosts. Fasthosts is a U.K.-based web hosting services providing shared hosting services since 1999. Since that time they have hosted over 1.4 million domains and over 411,000 websites. Throughout the years, they’ve stayed ahead of the curve offering the latest in technology along with features that set them apart from the competition. When looking at hosting services, I see the same set of standard features over and over. Fasthosts offer many of their standard features that are advanced features on other sites. If you use an SSD hard drive for your computer, you know how much faster those drives are. For many startups, the unlimited 100MB email boxes are a fantastic option. Most services only offer things like unlimited emails and ad vouchers for their top accounts. Fasthosts gives you those features as standard, regardless of which account you sign up for. Fasthosts has a user-friendly control panel that is designed to work for those with at least a rudimentary understanding of web design. Their web hosting isn’t for the rank beginner. If you want something similar to Wix or other basic website builders, you might want to consider Fasthosts’ website builder over their standard hosting. Fasthosts offers three different web hosting service, and each provides the same primary and advanced features mentioned above. Like most hosting services, the only difference is storage space, the number of websites you can host, and how many email accounts and databases you have at your disposal. In addition to standard web hosting, they offer a site builder service that’s good for beginners. Their website builder is similar to Wix and other drag and drop builders where you can point and click your way to a website. However, you don’t have most of the same features as standard hosting, and you will be limited on how you can design your page. Step 1 – Check for any known issues. They have a dedicated page for that. Step 2 – Search for your answers on their comprehensive support page that includes a knowledge base and downloadable PDF guides. Step 3 – If you still have problems, contact customer support via their 24/7 support number. Two things I don’t like about their support. They don’t offer live chat support. Many customers prefer live chat support. Also, they don’t provide a toll-free number. If you live outside of the U.K., then you will have to pay a fee to call. Fasthosts offers reliable web hosting with features that will give websites of all sizes the tools needed to be successful. Whether you’re a rank beginner or an experienced webmaster, Fasthosts has a plan that can fit your needs. 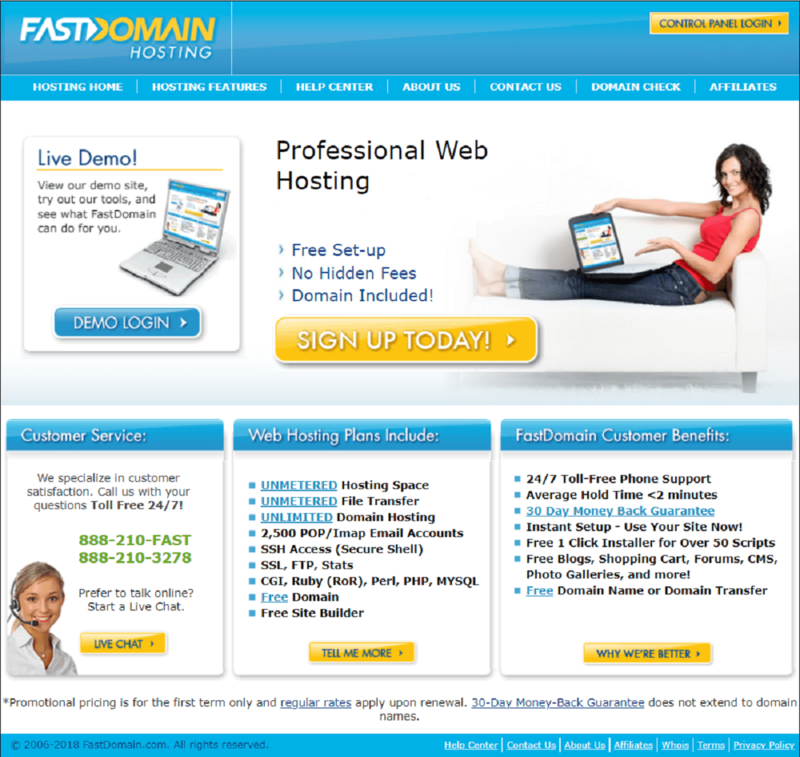 Wondering how FastDomain stacks up against other Web Hosting companies? Enter any other Web Hosting company and we will give you a side-by-side comparison.